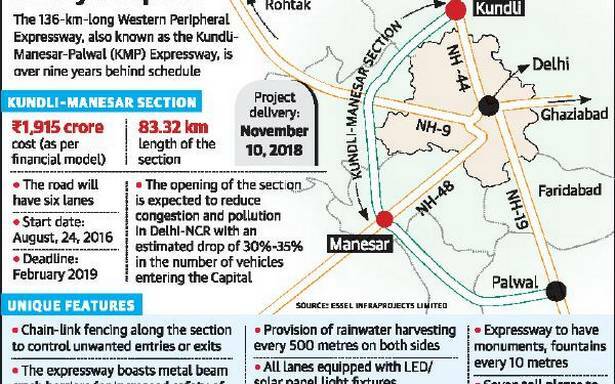 The 83 km Kundli-Manesar stretch of the KMP Expressway will be inaugurated on November 10 by Prime Minister Narendra Modi through a remote control from his office in Delhi. 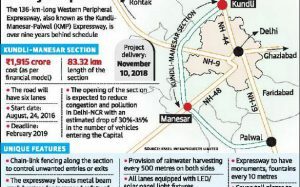 GURUGRAM: The 83 km Kundli-Manesar stretch of the KMP Expressway will be inaugurated on November 10 by Prime Minister Narendra Modi through a remote control from his office in Delhi. Another inaugural programme will be held in Kundli, where chief minister Manohar Lal Khattar will be the chief guest. Apart from the event in Kundli, inaugural programmes will be held at all six toll plazas on the expressway and cabinet ministers of different states will be the chief guests there. The expressway was scheduled to be inaugurated on Haryana Diwas on November 1, but had to be put off for later as the PM was not available for the event. “We have received a directive from the chief minister’s office to start preparations for the inauguration of the expressway on November 10,” said a senior official privy to the developments. The Kundli-Manesar stretch, once functional, will divert a significant volume of traffic, especially trucks, from Delhi, reducing congestion on its roads and pollution levels. The state government is under pressure to open the expressway soon in a bid to bring down the number of vehicles that passes through Delhi. Launched in 2006, the expressway is being built at a cost of Rs 1,863 crore. It was supposed to be completed by 2009, but missed several deadlines. The expressway has eight small and six big bridges, four railway over bridges and 34 underpasses. The total length of the expressway is 135 km, of which the Manesar-Palwal stretch was inaugurated by Union minister Nitin Gadkari last year. Sources in HSIIDC said some of the work on the KMP Expressway was pending, but expressed hope that the work would be finished at the earliest. “There is still some work pending, such as installation of street lights and slant protection work. It will take another 30-45 days to complete them,” said a HSIIDC official.